The Withings Pulse is a pedometer/activity monitor that pairs with a mobile app to track your physical activity, sleep quality, and pulse. You don't need a computer to see the full details of your data on the mobile app. You can team it with the Withings Wi-Fi Scale, the Withings blood pressure monitor, and their free Health Mate app to track your important health stats. 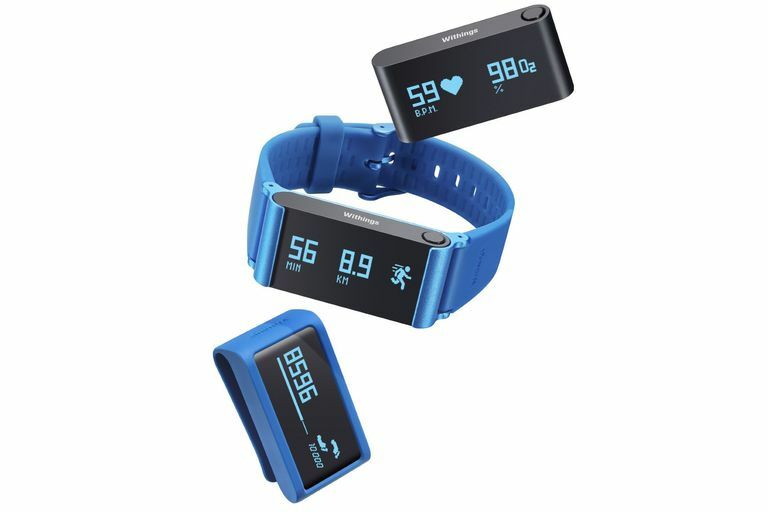 The Withings Pulse has an LED display on the sensor in addition to transmitting your data via Bluetooth to an iOS or Android app on your mobile device. You can use and enjoy the Pulse without the app, but you must use the app to upload your data to view on your mobile device or on the Withings Health Mate web dashboard. To set up your Pulse, first charge it with the USB cable and pair it with the Bluetooth on your iOS or Android mobile device. Then download the free Withings app for your device and complete the setup. The Bluetooth connection is very stable and I didn't have to keep reconnecting it. The app will check for Pulse data every six hours or you can force a sync by pressing and holding the button on the Pulse. You can view the display on the Pulse by pressing the single button on the side. The LED display is good for indoor use but too dim for me to read in sunlight outdoors. I had to move to the shade to read it. The numbers are large enough for my aging eyes. You can change the units from English to metric in your profile. Step Count: The count resets at midnight and counts up throughout the day, with little feet helping indicate this is the step display, and a bar showing your progress towards 10,000 steps per day. Elevation: Shows how many feet or meters you have climbed today. The accelerometer only logs this if you are doing it actively and changing actual elevation. Passively riding an escalator won't register, and neither will walking on a treadmill with incline or using a stair-stepping machine. Distance: Miles or kilometers estimated from your height and the accelerometer data. Unfortunately, you can't calibrate it or adjust your stride length number it is based on. The distance on the Pulse did not match well with the distance I measured with GPS or the distance calculated by pedometers where I could adjust the stride length for a better estimate. Exercise Calories Burned: Your activity calories burned above your baseline metabolic rate. Pulse Reading: To take your finger pulse, select the pulse/sleep screen and press on the heart for a second. Now place your finger on the back of the unit and the light sensor will read your pulse. I seemed to get an inaccurate reading every-other time. You can use it to take your at-rest pulse or use it during exercise for your exercise pulse. It stores up to 20 pulse readings and transmits all to the app when it syncs. Sleep Quality: To track your sleep quality, select the pulse/sleep screen and press on the moon for a second until it tells you Good Night. In the morning, press the button to see your elapsed time in bed and press it again to stop the sleep tracking and get a "Good morning" greeting. I never had any problem with the readings getting interrupted and turned off accidentally. Run Tracker: The Pulse automatically detects running and after a minute of running it begins to track the time and estimated distance. You can see this by swiping the Steps screen to the left. If you do more than one run, it simply adds that to the daily total rather than tracking separate sessions. My brisk walks at a pace of 16-minute miles did not record as runs. 10 Days in Review: You can review your data for the past 10 days for steps, elevation, distance, exercise calories. Just swipe the screen to the right to scroll through the days. You can view your data in the app at any time, and force a sync to see the most current data. The app consumes very little power as it only checks for new data upon request or once every six hours. Dashboard: The dashboard shows you your basic stats, and you can press the arrow next to each one to get to a detailed hour-by-hour display of the current day and past days. Physical Activity: The dashboard display shows your step count and progress towards a daily goal of 10,000 steps per day. The daily details screen shows a bar graph of your steps every half hour. It's color-coded, with blue for light activity, orange for moderate-intensity activity and red for vigorous activity. The activity detail screen also shows exercise calories, distance, elevation gained and activity minutes for the day. You can review unlimited past days, but they don't show weekly totals. You can't edit or add steps or activities that your Pulse didn't track. Heart Rate: Your last 20 readings show on the dashboard. On the detail screen, you can see your heart rate readings on a graph by day, week, or month. Sleep Quality: The Pulse sets everybody's sleep goal at eight hours per night. The details show total time in bed, time to fall asleep, number of awakenings, time in light sleep, time in deep sleep, and total time asleep. The graph color-codes this with orange bars for awake time, light blue for light sleep and dark blue for deep sleep. I found it too bothersome to attach the wristband, so I just attached the Pulse to my nightwear with the clip. The results compared very well with my experience and with the Fitbit monitor I wore the same way. The Pulse's sleep analysis is more detailed than the graph you get from the Fitbit, especially the light vs. deep sleep. In this way, it is much more like the MotionX Sleep App or the Jawbone UP. Weight: If you have a Withings WiFi Scale, the weight measurements and your weight goal will also show on the dashboard. Food: If you want to track your diet, you can link a free MyFitnessPal app to your dashboard. Log your calories with the MyFitnessPal app and they will also display on your Withings dashboard. This was very easy and seamless to add. Now you have a full-fledged system of calories in/calories out. Wellness Levels "Butterfly": The butterfly graphic assesses your wellness levels over the past seven days for four key areas: Weight, Activity, Sleep, and Heart. It has suggested additional apps or devices link to your dashboard. You can also view your data in more detail on the beta version of the Withings Web App. The data from your mobile app is automatically transmitted to your personal web dashboard. Besides similar dashboard daily displays as on the mobile app, the weekly grid of your sleep and activity pattern is amazing. For each half hour, it is color-coded for sleep intensity and activity intensity. You might spot patterns for sleep and activity. You may spot times during the day when you were sitting too much and be able to work on breaking up your inactive time. It also gives you your total steps per week and the average amount of sleep that week. You are able to share the data on your newsfeed via email, Facebook or Twitter. However, I was only getting newsfeeds on my weight measurements and not for my sleep or activity, which I would prefer to share rather than my weight! This is probably just a bug or will be corrected soon. You can also share your entire dashboard with a friend by entering their email. The Dashboard gives you encouragement and congratulates you for reaching goals. But as of this review, they didn't give badges for achieving milestones and you don't participate in challenges such as you can with Fitbit, Omron, Striiv and many other activity monitors. They promise you will be able to set your own goals for steps and sleep in the future. The Pulse system is excellent for walkers who want to track their walking activity, sleep, weight, food, calories, and heart rate. I'd say it's best for those with a goal of weight loss or overall wellness and health. I found it extremely easy to wear and use. If you don't have a computer but still want to see all of your activity and sleep data on your mobile device, Withings does that for you with their app. I especially like the on-sensor display of steps, distance, elevation, and calories, teamed with an app packed full of graphs and useful data. Too many otherwise-excellent activity monitors don't have a step display on the unit itself, and I find that far less motivating. My overall experience was that it would be a substitute for a Fitbit tracker, although it is much weaker in the social sharing and motivational areas and is only better in the sleep tracking display. While you can use the heart rate function during exercise to get a pulse rate, it isn't a substitute for a heart rate monitor that continuously tracks your heart rate and tells you whether you are in the best heart rate zone. I had only about a 50% confidence in the pulse readings I got with it. At least they were so far out of the expected values that I knew to repeat them rather than think they were correct. The Pulse doesn't track individual workouts except through the Run Tracker, and you can't log in activities that didn't get recorded in the step data. Currently, I think the app is weak on social sharing and motivational challenges and awards. But the basic design of the Pulse is excellent and apps can always be improved.